Lectures start at 7.45 for 8.00pm in the Drawing Room, Avenue House, 17 East End Road, Finchley N3 3QE. Buses 13, 143, 326 & 460 pass close by, and it is five to ten minutes’ walk from Finchley Central Station (Northern Line). Tea/coffee and biscuits follow the talk. Following the success of the past three training events and due to demand we have added one last date to the training programme. Our aim is to provide skills and training opportunities to volunteers who are keen to assist us in identifying new buildings and structures to compile a comprehensive new Local List of heritage assets in the borough and join our 43 current volunteers! For our current volunteers please feel free to join us if you would like a refresher, you are more than welcome! This final free event will provide you with the background, training and practical demonstration of what we need and how you can directly help. This will include information about how to identify, research and locally list potential heritage assets. At the event volunteers will be given the opportunity to choose an area to survey and receive a comprehensive volunteer pack. Places are limited and booking is essential, in order to reserve your place, or to find out more, email Hannah.barter@uvns.org, together with the names of all delegates and if applicable the group you are representing or please call the office with these details on 01538 386 221. As part of the redevelopment of the RAF Museum site in Colindale, I am leading on a project called ‘Historic Hendon’. I am running a programme involving projects that aim to link local people to the airfield and RAF history of the local Colindale and Hendon area. One project is to collect memories and stories from local people, who may remember the place as an airfield, or remember the development of Grahame Park over the year, or even met, knew, or have stories about people working on the airfield. These stories can be as long or short as you want to tell. We recently ran several workshops in the community and found an amazing resource of stories that we have never captured, but that tell the story of our local community and its history. We have recruited a team of volunteers and trained them with skills that help capture, discuss, and record these stories to preserve them for the future, and we will be looking to share these stories through future podcasts and exhibitions. If you or anyone you know of have some stories to share and are interested in taking part in an interview, or would like some more information, please get back in touch – it would be great to hear from you. On Thursday June 29th we experimented with a Bus Pass Outing as many of our members are over a certain age. The excellent Cross Rail Archaeology Exhibition at the Docklands Museum was the chosen destination for this outing. The Museum also has a permanent display giving the history of Docklands. We met at the Bank Station on the Docklands Light Railway (DLR) platform where 12 members assembled, and travelled to West India Quay station. A short walk and we were at the Museum where 2 more members joined us making 14 altogether. Everybody was at liberty to go round at their own pace. The Museum has its own cafe where members were able to lunch together or they could visit the Wetherspoons pub and a number of other restaurants almost next door. Feedback on the exhibitions will be in the next newsletter. We also have received a number of suggestions for further outings. You may well have spotted “Hopscotch”, the well-stocked sweet shop in Barnet High Street, opposite the Church. Mr. Michael Kentish, the proprietor, is also an historian - this helps explain the small panel to the right of his shop front. It looks a bit boring, rather like the timetable panel at a bus stop, but peer closely, and you will find it is crammed with hundreds of years’ worth of historical detail as well as some fascinating photographs. After years of campaigning led by CAMRA’s membership, the Government announced in March a historic change in the law to remove a longstanding loophole that has enabled developers to demolish pubs or convert them to another use without applying for planning permission. Although this change comes too late for thousands of pubs already lost, it will be crucial to supporting all the great pubs which remain for generations to come. All pubs in England will now be given the protection they deserve, and owners will always have to apply for planning permission before they can convert or demolish a pub. 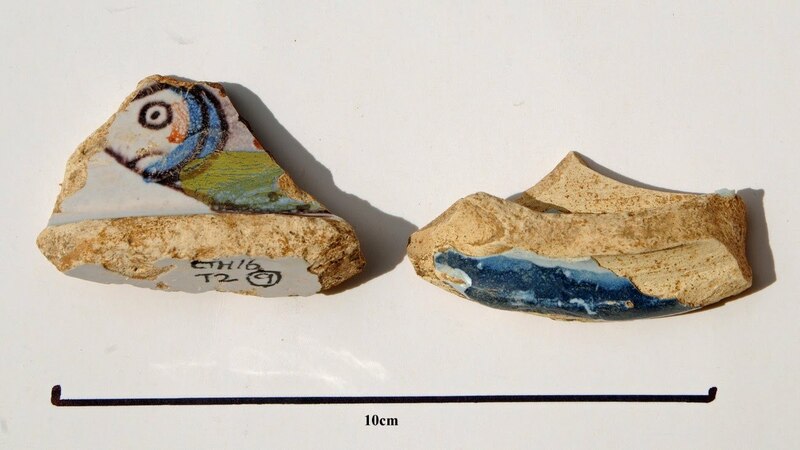 An interesting find (Trench 2, context 009) was sherds of a ‘Char Dish’ in Tin-glazed or Delft Ware. Char is a relative of the Trout; it’s found in the Arctic areas and the Lake District and is processed to a paste and served in these dishes. The vessels were quite popular with a fish motif on the outside and being made in a variety of pottery fabrics, Tin-glazed ones are often associated with Liverpool potteries perhaps around the mid 18th century. The rather comically glum expression on the face of the little fish made me curious about the dish, the fish and its culinary use. There are many pictures of char dishes on the internet, all seem to be of a similar size 23cm diameter x 4cm height, and all have somewhat naïve depictions of the Arctic Char in various fanciful colours. They seem to be datable to the 18th and 19th centuries and their purpose was possibly to make the delicacy of “Potted Char” more readily available to those with a discerning palate. Rather than a paste a la “Patum Peperium”, “Potted Char” appears more akin to “Potted Shrimps” in that cooked Char are sealed in their container with a covering of melted butter. I found the following recipe reproduced on Louise Allen’s blog https://janeaustenslondon.com/2016/03/ . It is from The Housekeeper’s Instructor; or, Universal Family Cook by W.A. Henderson (1807). After having cleaned your fish, cut off the fins, tails, and heads, and lay them in rows in a long baking pan, having first seasoned them with pepper, salt, and mace. Send them to the oven, and when they are done, lay them in your pots, and cover them with clarified butter. This fish is greatly admired, and is peculiar to the lakes in Westmoreland. I must confess I have not tried this recipe and only reproduce it here as an example of the use of the dish in question. The secret to the longevity of Roman structures built using concrete, particularly wharves and seawalls, lies in a complex chemical reaction between constituents of the concrete and seawater. It has long been known that Roman concrete contained lime and volcanic ash. Detailed research has identified components within the ash that are the key to explaining the continued strength of the material. A rare mineral called Aluminium Tobermorite plus another called Phillipsite have been discovered within samples of the concrete. The lime and ash mixture generates heat upon exposure to seawater, which in turn leads to the development and importantly, continued growth of the tobermorite and phillipsite, creating over time an increasingly strong material. Barnet has two key planning documents that deal with the Borough’s archaeology. It has the Local Plan Core Strategy and the more detailed Development Management Policies. Both these documents were approved by Council in 2012 following an examination in public, to which HADAS contributed. What do these documents say and how can we use them to further the interests of Archaeology in Barnet? Development proposals in these areas will need to provide detail in consultation with GLAAS of how they will investigate, catalogue and where possible preserve the remains in situ or in a museum as part of any application. It may also be appropriate for HADAS to be consulted. Barnet further remark, “where important archaeological remains are found the council will seek to resist development which adversely affects the process of preserving the remains on site. Where this is not possible mitigation which may include excavation, analysis of remains and public dissemination of results will be expected by an archaeological organisation with approval from the GLAAS and the council before development commences. If permitted, the loss through development of any archaeological remains will need to be recorded in line with para 141 in the NPPF. (National Planning Policy Framework) Planning conditions or a legal agreement will be used to secure this. Overall the Framework for considering Archaeology in Barnet appears strong. The practical application of the policy by the planning department does not always appear to fully reflect the fine words. Sterling work by HADAS members tries to keep the archaeology banner flying high. Over the years many developers in Barnet have submitted desk top appraisals on sites prior to development and some field reports have been completed. Using these, along with site visits, historical research etc. I’m proposing that we establish a HADAS Research Group to start in the autumn, on Sunday mornings at Stephens House, with the intention of reviewing all 19 of the Boroughs “Local Areas of Special Archaeological Significance”. Partly this will be so that we can proactively identify sites where we know in advance that we will want detailed archaeological work to be undertaken but also to prepare ourselves for the update of Barnet’s planning policies which will begin in the next 18 months or so and to which we can put detailed evidence of existing areas and possibly also identify new ones for inclusion. a. All heritage assets will be protected in line with their significance. All development will have regard to the local historic context. b. Development proposals must preserve or enhance the character and appearance of 16 Conservation Areas in Barnet. • how the benefits outweigh any harm caused to the heritage asset. d. There will be a presumption in favour of retaining all 1,600 Locally Listed Buildings in Barnet and any buildings which makes a positive contribution to the character or appearance of the 16 Conservation Areas. 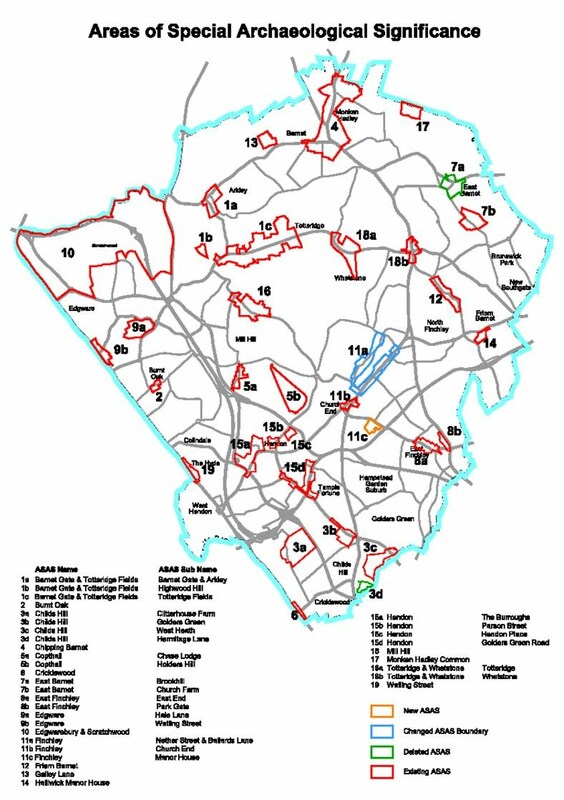 e. Archaeological remains will be protected in particular in the 19 identified Local Areas of Special Archaeological Significance and elsewhere in Barnet. Any development that may affect archaeological remains will need to demonstrate the likely impact upon the remains and the proposed mitigation to reduce that impact. Sunday 3rd September, 11am-3pm. Highgate Wood Community Day. Sunday 3rd September, 11am-5pm. Angel Canal Festival. Along the Regent’s Canal towpath from Islington & City Road Basin, N1. Lots of stalls including Islington Archaeological Society and London Canal Museum. Also live music, food stalls, boat rally & trips, craft stalls, etc. Free Entry. Thursday 7th September, 7.30pm. London Canal Museum, 12-13 New Wharf Road, Kings Cross N1 9RT. Limehouse & the area around. Talk. Admission after 7pm, £4 (£3 concessions). Friday 8th September, 7.45pm. Enfield Archaeological Society Jubilee Hall, 2 Parsonage Lane/jnct. Chaseside, Enfield EN2 0AJ. Forty Hall – Hidden Secrets: Archaeological Monitoring of Refurbishment Work 2012-2014. Talk by Neil Pinchbeck (E.A.S.). Visitors £1. Refreshments, sales & information from 7.30pm. Friday 8th September, Amateur Geological Society. The Industrial Archaeology of Brentford. Walk led by Mike Howgate. Lasts 2 hours. Cost £8. For details email mehowgate@hotmail.com Hiss address is 71 Hoppers Road, Winchmore Hill N21 3LP. Telephone 02088822606. Cheques should be made out to M.E. Howgate. Monday 11th September, 3pm. Barnet Museum & Local History Society, Church House, Wood Street, Barnet (opposite museum). The Rothschilds – An A-Z. Talk by Melanie Aspey. Visitors £2. Also Barnet Physic Well, Well Approach, Barnet EN5 3DY is open on Saturdays 26th August & 23rd September from 2-4pm. Free entry. Tuesday 12th September, 1pm, Society of Antiquaries, Burlington House, Piccadilly W1J 0BE. Smithfield Market – Its remarkable general market, those curious columns & The Museum of London. Talk by Dr. Jennifer Freeman. Tuesday12 September, 7.45pm. Amateur Geological Society, Finchley Baptist Church Hall, 6 East End Road N3 3QL (cnr. Stanhope Avenue, opposite Avenue House). The Textures of Peridotite Rocks of Sub-Continental Mantle Origin. Talk by Dr. Brian Tabor (Harrow & Hillingdon Geological Society). Tuesday 12th September, 8pm. Historical Association North London Branch, Jubilee Hall, 2 Parsonage Lane, Enfield EN2 0AJ. German Kings & The Holy Roman Empire. Talk by Robin Blades (secretary), followed by light refreshments & Branch AGM. Visitors £1. Wednesday 13th September, 7.45pm. Hornsey Historical Society, Union Church Hall, Ferme Park Road/Western Park, N8 9PX. The Great Houses of Highgate. Talk by Richard Webber (Highgate Society). Visitors £2. Refreshments, sales and information from 7.30pm. Wednesday13th September, 6pm. Gresham College at Museum of London, 150 London Wall EC2Y 5HN. From Royal Highway to Common Sewer: The River Thames and Its Architecture. Talk by Simon Thurley. Free. Part of the City of London 2017 Thames Festival. Friday 15th September, 7.30pm. Wembley History Society, English Martyrs’ Hall, Chalkhill Road, Wembley HA9 9EW (top of Blackbird Hill adjacent to Church). Tea & Memories. Talk & film by Debbie Nyman & Karl Roberts about the life & times of Roe Green Village. Visitors £3. Refreshments in interval – tea/coffee 50p. Saturday 16th September, 2pm. Hornsey Historical Society. Meet at Muswell Hill Library, Queen’s Avenue N10. History Walk of Muswell Hill. Led by Keith Fawkes (Chair). Ends at Northbank, Pages Lane N10 where refreshments & homemade cakes are available along with a talk about Northbank. Sunday 17th September, 11am-4pm. Hornsey Historical Society. The Old Schoolhouse, corner Tottenham Lane/Rokesly Avenue N8 7EL (buses W3, 41 or 91 stop nearby) will be open. There will be a small exhibition on aspects of local history. Members will be on hand including Albert Pinching (sales manager) to answer questions about the building. There are maps, books & postcards for sale. There is a collection of many rare photographs. Sunday 17th September, 11am-5.30pm. Queens Park Day, Chevening Road/Harvist Road NW6. Lots of stalls including Willesden Local History Society. Also live music, food stalls, craft stalls, etc. Monday 18th September, 9am. Mill Hill Historical Society. Coach outing to Chatham Historic Dockyard where there is much to see from warships, R.N.L.I. lifeboats, exploring the many galleries, & a whole lot more. Also included is a submarine tour & the Victorian ropery. You are free to take this day at your own pace. Various lunch options are available. Please book by Friday 18th August. Cost adults £37-50 (concessions £36). Coach leaves at 9am from Hartley Hall, Mill Hill Broadway NW7. Will leave for home at 4.30pm. Please send cheque and s.a.e. to Julia Haynes, 38 Marion Road, Mill Hill NW7 4AN. Cheques to be made payable to Mill Hill Historical Society. Contact Julia Haynes on 020 8906 0563 or email haynes-julia@yahoo.co.uk For electronic replies please supply your email address, otherwise give your name & telephone no. & no. of places required. Monday 18th September, 8pm. Enfield Society, Jubilee Hall, 2 Parsonage Lane, Enfield EN2 0AJ. A Palace on the Hill; a Story of Many Parts. Talk by Dr. Jim Lewis on the history of Alexandra Palace. Wednesday 20th September, 8pm. Edmonton Hundred Historical Society, Jubilee Hall, 2 Parsonage Lane, Enfield EN2 0AJ. Chase Farm Schools: Part 2 – Hospital. Talk by Frank Bayford. Visitors £1. Wednesday 20th September, 7.30pm. Willesden Local History Society, St. Mary’s Church Hall, Neasden Lane, NW10 2TS (near Magistrates’ Court). “A Willesden Green Walk”. Talk by Irina Porter (Chair) who has researched the boundary of the Willesden Green area & gathered many images which she will show. Saturday 23rd & Sunday 24th September, 11am-6pm. Enfield Town & Country Show, Town Park, Cecil Road, Enfield. Lots of stalls including Enfield Society. Also live music, food stalls, craft stalls, & new in 2017 – a Living History & Re-Enactment Village. Entrance £1-£5. Tuesday 26th September, 10.30am. Enfield Society, Jubilee Hall, 2 Parsonage Lane, Enfield EN2 0AJ. The Forgotten Houses of Tottenham. Talk by Valerie Crosby. Wednesday 27th September, 1pm. Gresham College at Museum of London, 150 London Wall EC2Y 5HN. Discovering the Port of Roman London. Talk by Dr. Gustav Milne (UCL). Free. Wednesday 27th September, 7.45pm. Friern Barnet & District Local History Society, North Middlesex Golf Club, The Manor House, Friern Barnet Lane N20 0NL. Friern Barnet on Film. Visitors £2. Refreshments & bar before & afterwards. Thursday28th September, 8pm. Finchley Society, Drawing Room, Avenue House (Stephens’ House), 17 East End Road N3 3PE. The Railways of the Northern Heights. Talk by Andy Savage (Exec. Dir. of Railway Heritage Trust & Avenue House). Visitors £2. Refreshments. Saturday 30th September, 2pm. Barnet Museum & Local History Society, Pennefather Hall, Christ Church, St. Alban’s Road, Barnet EN5 4LA. Battle of Barnet: Being Richard III. Talk by Dominic Smee & Richard Knox. Tickets on door £5, members £3. Refreshments.